For this project Ms. Lan was seeking a pre-designed webpage for her class project. For her class project she would like her students to create a simple webpage that showcases the students, like an “about me” page. She wanted a very basic website to be created due to the fact that she would like to customize it herself for the project. After the website she would also like to use her website as a teaching tool for her students. She would also like to be educated on the website hosting platform and she would like resources created so she can reference them. We decided to make a website using WIX. After consulting various website hosting platforms WIX seemed like a great choice due to the amount of creativity and customization it allowed. Since the project was an about me page students will be able to have the best time designing a webpage that best reflects their individuality. A Google account was also set up for Ms. Lan to use to monitor her website. We decided to make a website where front page would be a brief welcome page to Mackenzie French then the other pages are pages about French language at Mackenzie. We made Ms. Lan a Google account to monitor her website. For many classes one of the first assignments is to create a memoir, by having students create a digital memoir like a digital website for their assignment, would make it a more interactive and personalized memoir project. It adds creativity that a typed essay cannot. We used WIX to host and create the website. We choose this because we decided that WIX was a very easy to use website creating platform and it offered creativity and changeability of the website and its design. Many of the sample sites that we saw were very creative. The website assignment needs a website creation software that offers creativity because each student needs a different style of website, the websites cannot look like cookie cutter versions of the same website which is why we decided to choose WIX. We used Google accounts for Ms. Lan because we felt it was a very fitting account for a teacher to have. As Ms Lan said before she wanted to use the website for her class after the assignment was due as a resource for her students. We decided to make her a Google account because one of the many features of a Google account is Google drive, if she ever needed to post a file on her website she would be able to upload the file to drive and post the link to her website. We created a website using WIX the website was a template in which we customized and changed in order to customize it. We added a welcome page and other pages to meet the needs of a teacher website for example a contact form and a calendar. 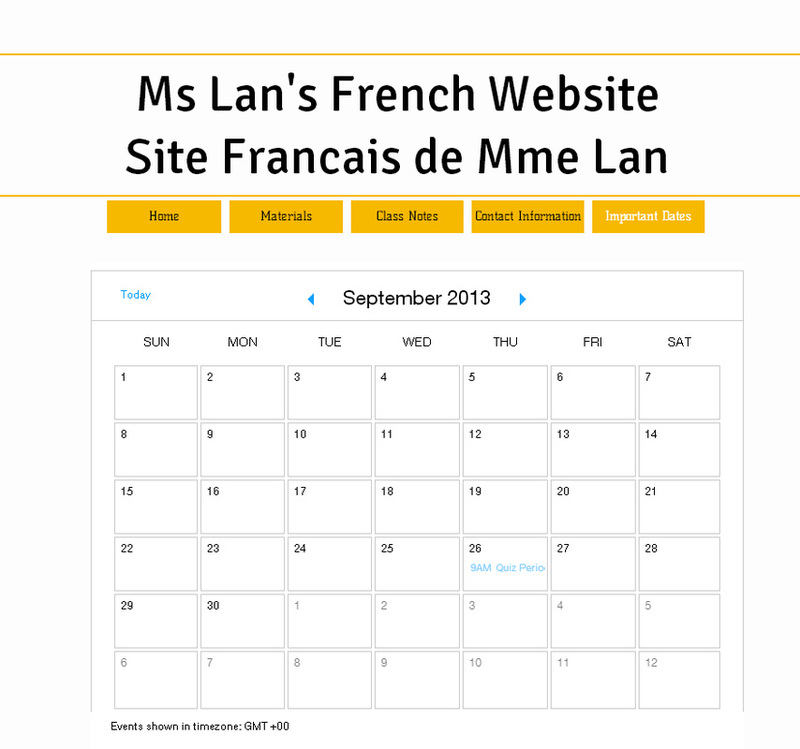 Once the preliminary website was designed we went to Ms Lan to offer her some training sessions. We sat down with her to train her how to use the WIX to create and change aspects of her website. As the training progressed we made reference materials of how to do certain prompts on WIX, Google accounts and other Google Software. This is the welcome and about page, we made a versatile website that can be edited to suit the teachers needs. This page is mainly blank because it was met for the teacher to edit to her needs as the website project arose for her class. 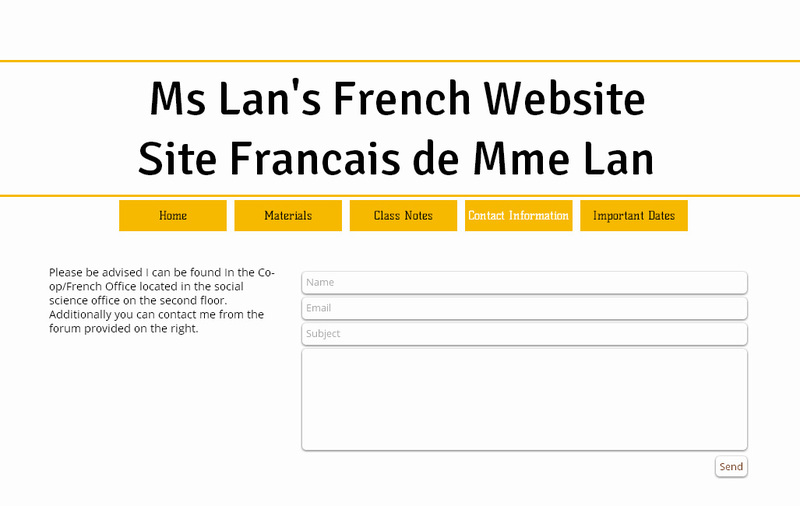 As Ms Lan indicated she would like to have her website for future after the project is finished, one of the things she mentioned was a contact form which we embedded in her website. We also placed her school location information as well. We also added a calendar for her website because she would like to update the calendar with important dates for her students. After we finished the website for Ms Lan, we had an educational workshop regarding the website. It was a tutorial workshop which we ran in order to use the features in WIX. During the workshop we created resources for her to use in order to remember certain steps on the website. At the end we gave her the account information for WIX and her Google Account. Once the tutorial workshop finished we checked on her progress on a weekly basis until she was able to use the website independently.